Claiming everything from whiter teeth and healthier gums to decreased body aches and pains, oil pulling is the latest trend in DIY detox therapies. 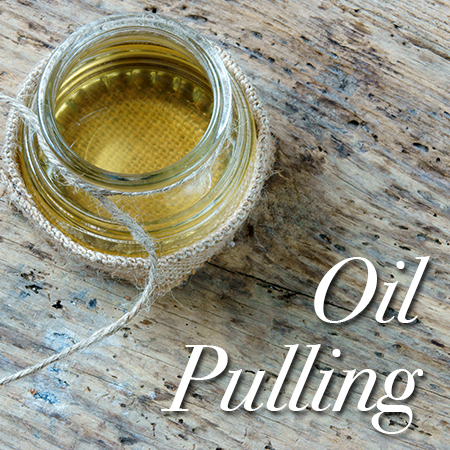 Newly popular among celebrities and lovers of natural health and wellness, oil pulling is a hygiene practice that actually dates back centuries through the Indian medical tradition Ayurveda. Simply put, oil pulling uses common plant-based oils (coconut is a favorite) in place of store-bought mouthwash. Users swish, or “pull” one tablespoon of oil in their mouth for 10-20 minutes every day. The oil usually doubles in size due to collecting saliva and toxins from the mouth. Users are strongly warned to spit out the oil because it contains the microorganisms which pulling aims to extract. Oil is believed to draw toxins out of the mouth by sticking to their outer, fatty layer. Since oral hygiene is linked to health in all parts of the body, it’s believed that the benefits of oil pulling go beyond just your mouth. The jury is still out on oil pulling. Some dentists favor the practice more than others. Beyond anecdotal evidence and some preliminary studies, there’s not absolute proof that oil pulling does what it claims to do. This doesn’t mean it’s all a lie. In fact, coconut oil does contain vitamins and antimicrobials that might make a good addition to many of your personal hygiene routines. Still, for the most desirable results, your best bet is to make an appointment with your Shelby dentist and receive a full, personalized dental care plan. Taking an active role in your own wellbeing is certainly important, but remember nothing can replace the experience and wisdom of a licensed dentist. Shelby residents are encouraged to make an appointment at Discovery Dental for a consultation and to discuss dental care options with our dentists. If you suspect you have a real problem with gum disease, bad breath or other health concerns, do not rely on oil pulling to fix these issues. Call Dr. Miller at Discovery Dental today for an appointment to discuss all your ideas and desires for a healthier smile.